House Speaker John Boehner of Ohio, second from right, administers the House oath to Rep. Dan Newhouse of Washington on Jan. 6. Joining them are Newhouse’s wife Carol, center, and other family members. Central Washington’s sleepy Yakima Valley, perhaps best known as the nation’s top producer of hops and apples, is a safely Republican region. But it may have also quietly produced the most intriguing election outcome of 2014. When respected, 10-term GOP congressman Doc Hastings announced his decision to retire from his 4th District seat representing Yakima and the Tri-Cities last February, Republicans Dan Newhouse and Clint Didier threw their hats in the ring — along with six other Republicans, two Democrats and two independents. Elected to the state House four times since 2002, Newhouse grows hops, fruit and alfalfa on a 600-acre farm outside the central Washington town of Sunnyside. He had earned the trust of a who’s who of agriculture groups, as well as business organizations like the National Federation of Independent Business. Overall, he garnered a reputation as a knowledgeable public servant who got along with just about everyone, including former governor Christine Gregoire, a Democrat, who in 2009 appointed Newhouse as the state’s agriculture director. In experience, style and support, Didier represented a very different kind of Republican. A local football standout who won two Super Bowl rings as a tight end on the Washington Redskins in the 1980s, Didier returned home after his NFL career to run an excavation business and coach high school football. But he also became a prominent tea party hero, running unsuccessfully for U.S. Senate in 2010 and state commissioner of public lands in 2012. He earned endorsements from Sarah Palin and Ron Paul, praise from Glenn Beck, and a reputation as a hell-raising agitator. In 2013, he appeared to warn a crowd at a gun-rights rally to prepare for a coming doomsday. Newhouse quickly rounded up the most financial backing, along with a laundry list of endorsements from local elected officials, including Hastings. But Didier began his campaign much better-known than Newhouse thanks to his past runs, and he better reflected the Republican base’s anti-tax, anti-Obama, anti-Washington anger. In the August primary, Didier finished first, edging out Newhouse 32 percent to 26 percent. The top vote-getting Democrat, former congressional aide Estakio Beltran, finished a distant third with 12 percent. If the race had played out in any one of 47 other states with a winner-take-all primary system, the contest would have effectively ended right there: Didier would have won the GOP nomination, and given the district’s heavy Republican edge, would have crushed Beltran in November. Upon taking office, Didier would have fit quite well into the band of House rabble-rousers that perpetually antagonizes Speaker John Boehner. Instead, Didier is still in Washington state. That’s because Washington is one of three states (California and Louisiana are the others) where all candidates, regardless of party, appear on the same primary ballot and two members of the same party can advance to the general election if they happen to finish in first and second place. Under this system, known as a “top-two primary,” Newhouse’s 26 percent share was good enough to advance. The November vote, featuring a turnout 43 percent larger than August’s primary, was a much different election. The district’s modest contingent of Democratic voters, revolted by Didier’s brash brand of politics and encouraged by their own party leaders, supported Newhouse. Meanwhile, moderate Republicans simultaneously promoted Newhouse as a “conservative farmer and businessman” and pummeled Didier as an extremist. Newhouse was sworn into Congress this month. “Washington is broken” has become the biggest cliche in campaign advertising, yet the Democrats and Republicans who say those words on camera are more often than not playing a role in an electoral system that further entrenches dysfunction and rewards the extremes. Many Americans would be surprised to learn that fewer than 10 percent of voters at each margin of the political spectrum are effectively choosing more than 90 percent of the members of Congress. Meanwhile, there’s been a steady rise in straight-ticket voting, in which voters stick with their party all the way down the ballot. As a result, in more than 90 percent of all House seats, the biggest risk to an incumbent comes in the form of a primary. That creates an unvirtuous cycle that rewards fringe behavior and punishes those who have reached most frequently across the aisle. Rep. Charlie Dent of Pennsylvania, who co-chairs the center-right Tuesday Group of House Republicans, agreed. “There’s a great deal of fear of primaries among my colleagues,” he said. And who votes in those primaries? A shockingly thin sliver of the electorate. In some states, the figures are even worse. Increasingly, the narrowing slice of voters who do participate in primaries consists of the most hard-core liberals or conservatives. Today, according to Gallup, 43 percent of all adults call themselves independents. In many states, voters not registered with a party can’t participate in primaries. “A lot of base primary voters have become more ideological,” Dent said. Dent, whom National Journal ranked as the 52nd-most moderate Republican of the 234-member conference in 2013, was lucky enough to escape 2012 and 2014 without a primary challenge. But not all of his moderate colleagues have had it so easy. Last June, the third-most moderate Republican in the House, New York Rep. Richard Hanna, nearly lost his seat to conservative state Assemblywoman Claudia Tenney in a primary in which fewer than 6 percent of the district’s voting-age population voted. Three weeks earlier, the 12th-most moderate Republican in the House, New Jersey Rep. Leonard Lance, nearly lost his seat to tea-party-backed businessman David Larsen; fewer than 5 percent of voting-age residents cast ballots in that primary. Hanna was unopposed in November, while Lance won by 20 points. Advocates of top-two primaries say members of Congress would be more likely to work with the other party if they knew they didn’t have to finish first in an ultra-low-turnout race dominated by ideological edge cases. Sen. Chuck Schumer of New York is one of them. In July, he wrote a New York Times op-ed denouncing the partisan primary system as a “menace to governing” and calling for a national movement to adopt top-two primaries like the one in Washington state. Dent said the conversation in his home state has focused on opening up Pennsylvania’s closed primaries to independents. But he says the top-two may hold promise, too. “The system we have now, there are far too many [members of Congress] who find it far too easy to vote no” on key bills. Detractors of a top-two primary system argue that it essentially disenfranchises the minority party in a given state or district, because it deprives some voters the opportunity to vote for the party of their choice in November. 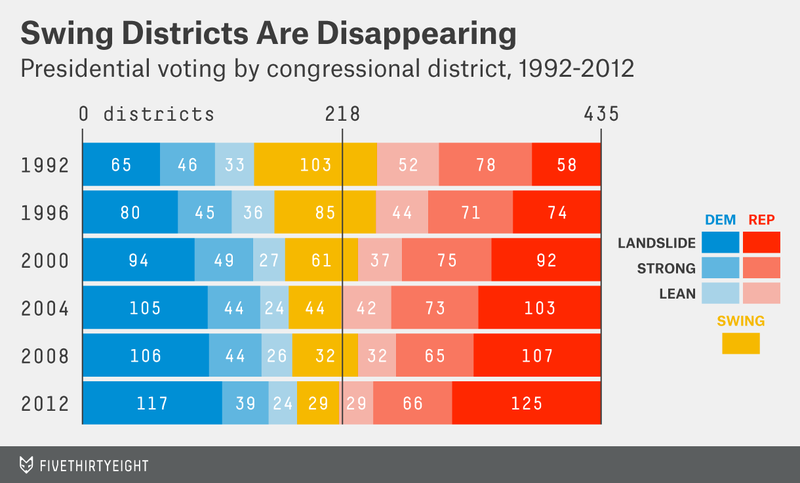 But in most of today’s lopsided states and districts, the minority party is no longer viable or relevant. A top-two system can instead empower a minority party by making its voters the critical swing bloc in a general election, as it did for Democrats in Yakima. The impact is bipartisan: What happened in Yakima in 2014 is a mirror image of what transpired two years earlier between two Democrats in California’s 15th District. For 40 years, Pete Stark sat in such a strongly Democratic district that he could indulge a cantankerous streak that bordered on the offensive. (In 2007, the congressman accused Republicans of wanting to send troops to Iraq “to get their heads blown off for the president’s amusement.”) But in 2012, the year California implemented the top-two primary system, a pragmatic city councilman, Eric Swalwell, finished second to Stark in the June primary. In November, aided by Republican voters, Swalwell ousted Stark. Not everyone is convinced by top-two primaries. As FiveThirtyEight’s Harry Enten has highlighted, early academic research has cast doubt on the effectiveness of the new system in California. Political scientists Douglas Ahler, Jack Citrin and Gabriel Lenz have argued that voters don’t take the time to differentiate between more moderate and more extreme candidates. In their simulations, moderates fared no better in top-two scenarios than in closed primaries. Gathering public support has also proven challenging. This year, former New York mayor Michael Bloomberg and Texas billionaire John Arnold each spent more than $1 million to try to pass a top-two ballot initiative in Oregon. But both major state political parties, aware that a top-two would weaken their influence over primaries, opposed the measure and it failed 2-to-1. Reformers in Colorado have struggled to collect enough signatures to advance a similar initiative. Still, even skeptics acknowledge it may be too early to gauge whether top-two primaries can reduce gridlock and lead to more bipartisan policymaking. There have been other signs in the system’s favor. In Washington, where the top-two has been in effect since 2008, several moderate Democratic state senators bolted from their caucus to form a “majority coalition” with Republicans after the 2012 elections, and the two parties ended up splitting committee chair responsibilities down the middle. At the very least, Dan Newhouse’s victory over Clint Didier in Yakima shows that a top-two primary can offer a path toward something radically promising — that if the rules of the political game are adjusted, the center can indeed hold. 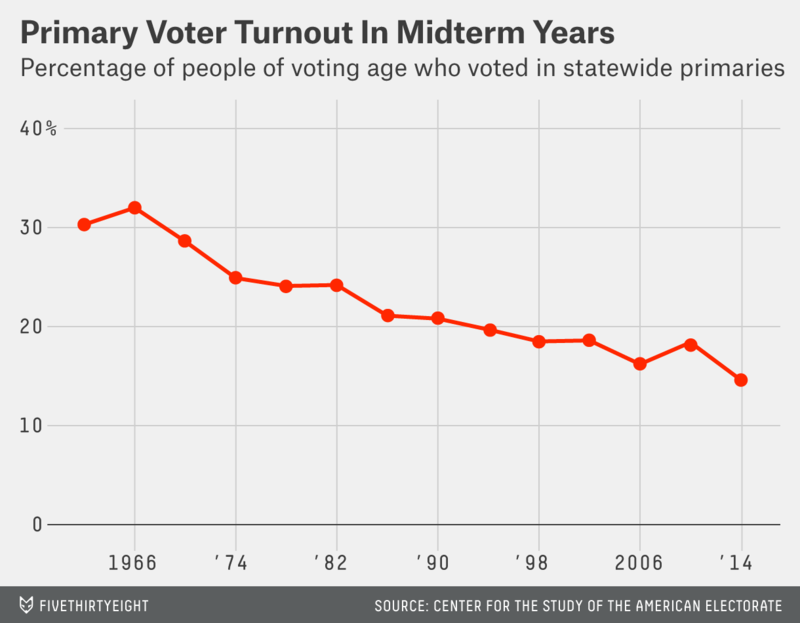 CLARIFICATION: An earlier version of a chart in this post didn’t make clear that it showed data on primary voter turnout in midterm years.